Looking for a way to collect event submissions from your community? 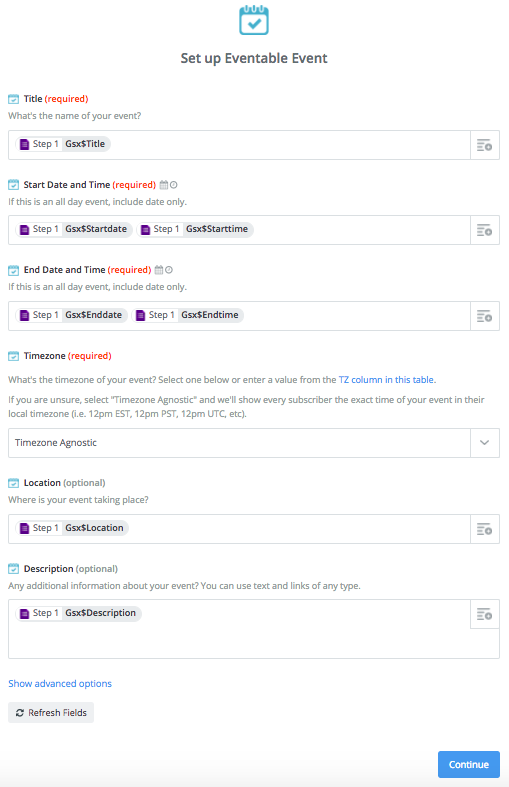 This guide will help you set up a Google Form where people submit events, which will then be automatically added into your Eventable account. Creating a crowdsourced community calendar couldn't be any easier! 1. Create a Google Form for collecting event submissions. You can take a look at this form here as an example of what fields are required. 2. Set up a Google Sheet for collecting responses to your form. If you need help setting this up, take a look at this guide from Google (select "Choose where to store responses"). You can view an example sheet here. 3. Once you've set up your form and spreadsheet, go ahead and submit an event through the form to make sure it shows up in the spreadsheet. You need to have at least one completed row in your spreadsheet before continuing. 4. 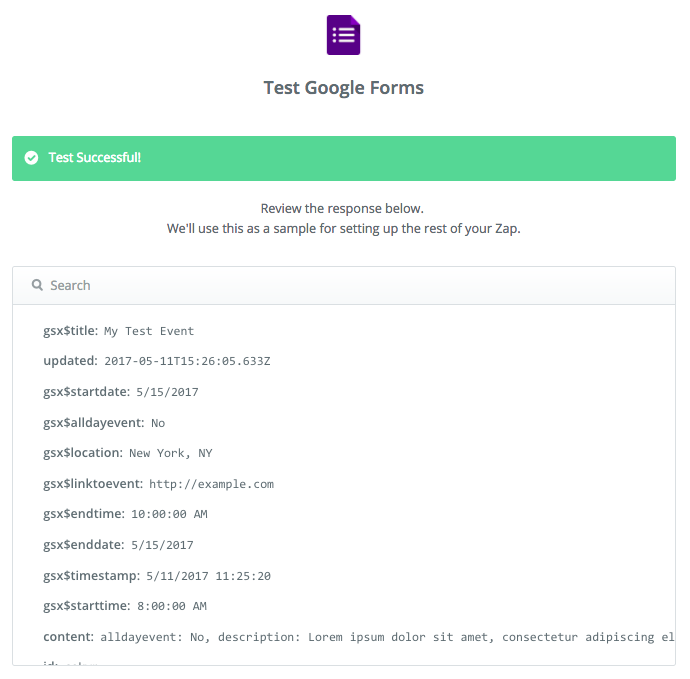 Now, we'll be using Zapier to connect Eventable to your Google Sheet. Use this link to start setting up the integration. 5. Connect your Google Forms account and select the Spreadsheet and Worksheet with your responses. 7. Next, proceed with connecting your Eventable account with Zapier. If you need help, you can view our setup guide here. 9. Once you're finished with your template, proceed to the "Test Eventable" step and click the Create & Continue button. After you see the success message, check your Eventable Dashboard to make sure the event was created in your account. 10. Finally, click Finish and turn on your Zap. You're done! Now, every event that someone submits through your Google Form will automatically be added to your Eventable account. 💡 Pro tip: Want to review events before they get published to your feed? Select Advanced Options when setting up your Eventable event template and set "Save as Draft?" to "yes". This way, you can review & edit any events before they're sent to everyone's calendars.